Traditionally bound to Sicily (above all to Messina) through tight commercial links, the City sided with Sicily in the anti-Angioina revolts (Vespri Sicilians, 1282) and gave support to the Aragonese forces in the subsequent Vespro war. The peace of Caltabellotta (1302) fully assigned the City to the Angioini from the Reign of Naples, by which it was ruled during the course of the 14th Century, and therefore obtaining a wide communal prerogative. Involved in the struggles for succession between the Angioini and Durazzeschi, it was conquered and lost by both parties; yielding definitively to Alfonso V il Magnanimo, King of Sicily. Reggio was from this time (1443) taken from Renato d’Angiò due to the help that the Reggini had lent to the last mentioned, the City was deprived of the prerogative of main town of Calabria, in favour of Catanzaro. Its rights were reintegrated by Ferdinando I (1465), being conquered by Consalvo di Cordova for Ferdinando II, the Catholica. In the 16th Century it was devastated numerous times by Barbarian and Turkish raids, initiating a progressive decline, which had its epilogue through the earthquake of 5th February 1783. Occupied by the French in 1806, in 1810 it was erected as Duchy by Napoleon, for one of his generals, Oudinot. It therefore had a noteworthy part in the Liberal and Renaissance Revolts, and after the Garibaldine conquered it on 22nd August 1860, it became part of the Reign of Italy. Reconstructed after a terrible earthquake in December 1908, which took over 40,000 victims, and then during the Second World War, it suffered grave destruction due to the heavy bombardments which prepared for the occupation of the City by the troops of the British Army, 8th Division (3rd September 1943). 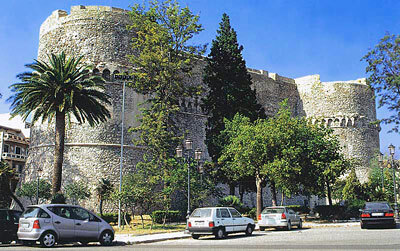 The present day urbanistic layout, occupies the area of the old centre; the zone of the Fort coincides with the present day Piazza Italia; it has been possible to identify traces of the walls, on the further side to that of the coastal area, where the Sanctuary of Artemide was established. The remains of thermal buildings and private habitations with interesting mosaics have also been found. The main archaeological finds from the region of Calabra and Lucana, are preserved in the local Museum, which has gathered in diverse sections, material from the pre-historic era, as well at the Hellenistic, and the famous “Bronzi di Riace” (“The Bronze Statues of Riace”).